Zachary really likes you. He says “ho, ho, ho” all the time. We both love you very much. Apparently, she was concerned about Zachary having been good enough for presents so she was making one last push for him. 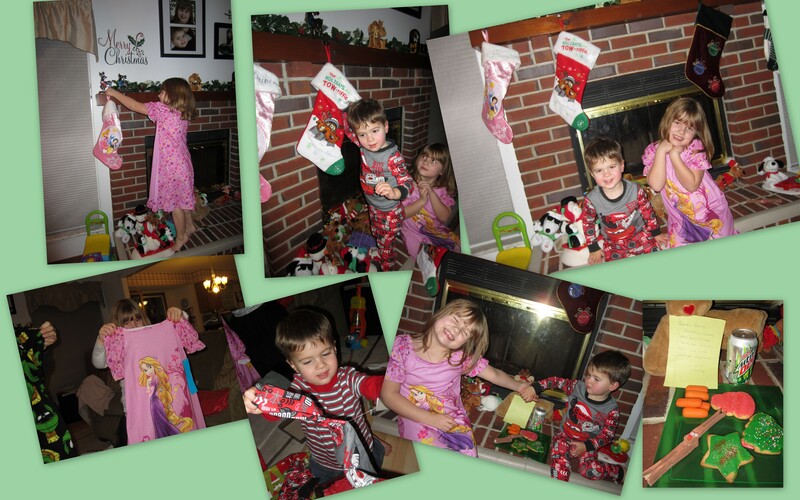 The kids also hung their stocking with care. Then it was time for the kids to snuggle down into their beds. And the real magic was about to begin….. Mommy and Daddy’s work time. Once we had Emily, we decided that we wouldn’t travel for Christmas. We wanted her to be able to wake up in her own bed and discover what Santa left her. We also decided that we weren’t going to try to split the day between both sides of the family and travel a lot on Christmas Day. We would rather have our day a little more relaxed and really reflect on what the day is about. We still celebrate with my family, but on a different day. It’s worked out well, in my opinion. Especially as the cousins get older and want to stay home and play with their new toys. I am glad that we still get together to celebrate, even if it is a few weeks early. I love, love seeing all the kids together. So many, so close in age. 7 children, ranging from 5 to 1 1/2. It’s awesome! This year was no exception on the fun and excitement. We even had some excitement in the basement with the hot water heater but that is a whole other story. We ate; we laughed; we opened presents. It was a zoo. I loved every minute of it! Emily had her Christmas party last week at school. A party isn’t complete without a visit from the jolly one himself of course! Zachary and I ran up to the school so we could get a picture of “Sisser” sitting on his lap. We didn’t stay for the rest of the party. Zachary was a) wanting to sit on Santa’s lap b) join in on snack time and c) play with their toys. Not really a good combination. After getting a few quick shots we snuck out and went to the library. More fun for the wee man. When we arrived, Emily and her classmates were finishing up music class. It was so cute to hear their little voices yelling singing Christmas songs and dancing to the music. Then each child got to take a turn sitting on Santa’s lap and telling him what he wanted for Christmas. Super cute class! Hard to believe that this is her last year in preschool. From my Santa and elf to you! The kids and I decided to head over to the Bass Pro Shop to check out their Winter Wonderland last week. I have heard that it is a lot of fun but it is super busy. We live very close to the store and know that traffic is atrocious on the weekends and try to avoid the area at all costs. I decided that I would take the kids to see the fat man after Zachary’s nap one day so that we might have a fighting chance of seeing Santa without feeling rushed and overwhelmed. Wonderful decision! We headed over there around 3:30 and there was one child ahead of us to see Santa. Poor little girl was about 2 or so and wanting absolutely nothing to do with him. Emily took her turn and sat right down on Santa’s lap. She told him all the things she wanted for Christmas, the big one being a new bike. She also told him that Zachary loved cars and he wanted a trike. 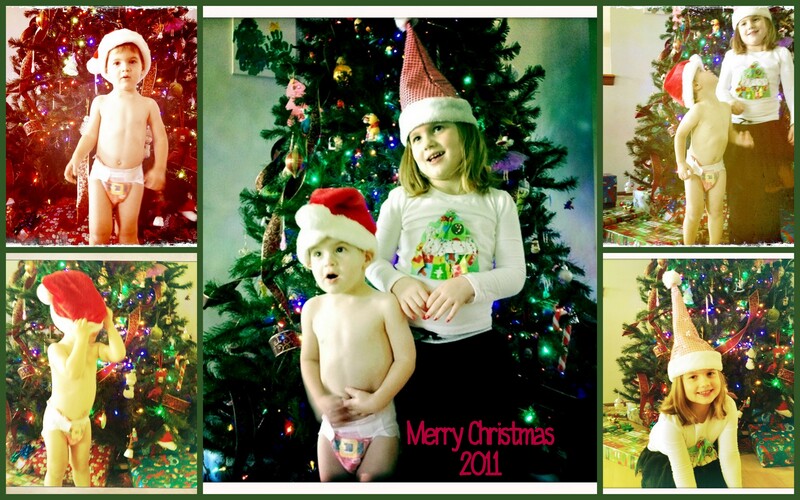 When it came time to have Zachary sit on Santa’s other knee I began to question whether or not he would do it. It took a little coaxing and arm twisting but he did it. I am sure I told him that we needed a picture for Gaga at one point. I can bribe that kid with Gaga all day long. He wasn’t too sure of the situation but we got a decent picture and that’s what counts! After we gave Santa our list, we decided to check out all the fun things Bass Pro had set up. We rode the little carousel three different times. It was awesome! There were no lines; no waiting; no worrying about what animal we were going to sit on. The kids got to play with the remote control cars and even take target practice with the toy gun game they had set up. Zachary loved the train set they had set up. Definitely a good experience. Definitely glad we went during the day. This year we spent Thanksgiving with my family. It’s been a few years since we spent the holiday with them so it was definitely past due. We arrived a little early so we could help my sister finish up the yummy preparations. The kids were able to get a head start on destroying everything playing together. I love when the cousins get together. The laughter and giggles definitely outweigh the referring. It’s amazing how much they fight and knit pick already. Guess you would expect no less since there are 7 children age 5 and under. It’s always a mad house! And this Thanksgiving was no exception. The food was delicious and the company even better. We had such a wonderful time. The kids played so hard that they were asleep even before we hit the interstate. I really do love my family- crazy as each and every one of us are. It seems like there are so many things to do around Halloween. Pumpkin patches, parties, tons of trick or treating opportunities. In an effort to save time, I am going to talk about all of our fun at once. We started out our trick or treating festivities at Stephen’s office. Last year was our first experience at his work. Oh my goodness. It is so hard to describe how much effort goes into this event. Each area decorates and everyone dresses up according to a theme. The main theme this year was Children’s stories/shows. The IT department even participated this year. I told Stephen they were all stick in the muds and they were going to decorate even if I had to come in there and do it myself! They went with a Scooby Doo theme. Stephen even dressed up as Shaggy. Unfortunately, I didn’t get any pictures of their area. I didn’t take pictures of all the areas because I didn’t want to be “that” dork. Every area outdid themselves this year. A few of the themes were Toy Story, Cars, Under the Sea, Candyland, Snow White, Zoo, Alice in Wonderland and It’s a Small World. There were a lot more but I can’t remember them all. Emily, of course, loved Under the Sea. I thought It’s a Small World was pretty cool. They put the kids in wagons and pulled them through the different countries. Honestly, it was hard to choose who was the best. They always are over the top with the candy handed out. We really didn’t have to do any more trick or treating if we were just going on Halloween loot and candy. Emily got to dress up at school. They did a little parade to show off all of the costumes. It was so cute to see all the kids dressed up. They got on stage and told everyone their name and what they were. I don’t think there were any duplicate costumes, which really surprised me. On Halloween, we headed downtown to go to Trick or Treat on Main Street. This has quickly become a tradition for us. Grandma comes with us and we walk down Main Street and collect candy from the merchants. It’s always a lot of fun to see all the costumes. We never make it all the way around. Later that evening, Stephen took both kids out to trick or treat around the neighborhood for a bit. After they went to a few houses, Zachary stayed home and I took Emily around to a few more houses. We met up with her bff and they had a lot of fun running up to the houses. So much Halloween fun! Way, way, way too much candy. I have a huge paper bag full of candy to get rid of. I think we need to cut some trick or treating down next year. It will be a lot different with Emily being in kindergarten that for sure. We really wanted to enjoy this last year of “freedom”. 3 parties. 3 cakes/cupcakes. 3 opportunities to open presents. That’s how we rolled this year. The Saturday after Emily’s birthday we headed to Centralia to visit my family. 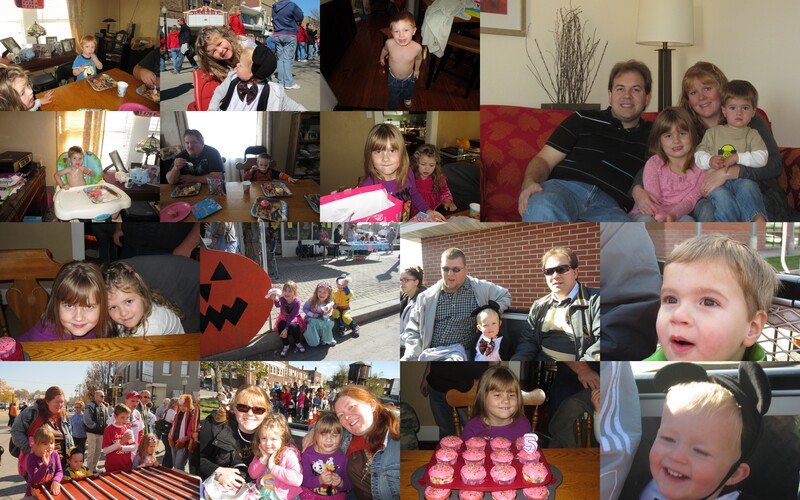 We were planning on going to their fall festival, Halloween parade and celebrating Emily’s birthday. We even booked a hotel room in Mt. Vernon so we could get a longer visit in and not feel quite so rushed. We met my family in the downtown area. Emily decided that she wanted to watch the Kiddie Halloween parade this year instead of walk in it. She really enjoyed seeing all the costumes and floats. After it was over, we met up with my siblings and the kiddos. We decided that we were going to check out all of the fun stuff going on. Stephen and my brother headed over to the chili cook-off, Jason and the two boys went to check out the cars while Heather and I took the girls and Timothy to the bounce house. That was the original plan. After seeing the line, we decided the pig races were a better option. After lunch we headed over to the train area. We got to take a ride on the little train and boogie to the music. After all the fun in town, we headed to the Tate’s house. Cupcakes and ice cream! And presents! Emily was really spoiled by everyone. We never made it to the big Halloween parade. It was really cold that night! And people had been securing spots since early in the morning along the parade route. We decided that it would be a lot more fun to stay at the house, be warm and not have to worry about the kids running into the road for candy. I think we made the right choice. By staying in, we really had a good visit. It was really nice to get to talk to every one and unwind. The kids got some bonding time in while the rest of us had lots of laughs. We really need to do that more often! A day to celebrate our freedom. A day of parades and bbq. A day to kick back and relax. A day to watch the sky be lit up with fireworks. A morning of rain??? Not what you were expecting. Not what we were expecting, that’s for sure. Rain, all morning long. We were really debating if we were going to make it to the annual parade on Main Street. Emily was really looking forward to it and was very disappointed when we woke up to rain. And then it stopped. We loaded up the car and started to head down to find a spot to enjoy the festivities. And then it started pouring. Crying ensued. After checking the radar, we determined that the rain would probably just blow over in time for the parade. And it did. Partially. It stopped raining long enough for us to pick a section of wet curb to watch the parade. We even got to watch about half of the parade before it started raining again. We were down there, darn it! And we were prepared! We had umbrellas! We were going to tough it out and finish what we started. Persistent? Or self-preservation from crying? It was a great parade, despite the rain. The kids had a great time and got to visit with Grandma and Papa at the same time. Normally we go to Stephen’s parents for a bbq later that evening but Stephen’s mom is in a cast from her thumb surgery. We couldn’t let tradition blow out the window so we had everyone over at our house! It was fun. The kids got to play with Aunt Nina and silly Mike while Stephen grilled some brats and burgers. We ate, chatted and had a great time. We ended up watching the fireworks from the parking lot of our church this year. The park we normally go to was very soggy. So soggy that the carnival rides had to be set up on the street. Emily didn’t mind. She could see the fireworks just fine and didn’t have to worry about crowds or people blocking her view. It was a great night!